Located throughout the Miami-Dade area, Sabor Tropical is a popular chain of supermarkets. With seven stores in Miami, Kendall, Homestead, and Miami Beach, Sabor Tropical supermarkets cater to the working class, Hispanic community. 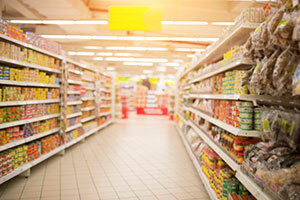 Thousands of shoppers visit the supermarkets each day, taking advantage of good prices and authentic cuisine. Sabor Tropical markets are often located in strip malls. Although they offer great deals inside, getting to the stores can be a challenge with their small parking lots, tight turns, and large influx of customers. High frequency of traffic and parking spots pointed directly toward the entrance and exits of the store can contribute to storefront crashes. Cars may accidently drive through the windows or walls of the building, hitting patrons and employees inside, as well as causing extensive property damage. Storefront crashes are particularly dangerous. Patrons and employees often have no notice that an accident is going to occur until a vehicle crashes into the window or walls of the facility. Many times, those inside are going about their business – whether that is grocery shopping or sitting down for a bite to eat. Throughout the nation, it is estimated that 500 people lose their lives every year as the result of a storefront accident, with another 4,000 sustaining injuries. If you or someone you love was hurt in a storefront accident, you may be entitled to compensation to pay for your medical bills or recover wages that were lost due to an inability to work. The Sabor Tropical personal injury attorneys at the Wolfson Law Firm can help. Our attorneys can answer your questions and advise you of the options available to you. If you have been injured in a storefront crash, you have rights. To find out what compensation you may be entitled to, contact the Wolfson Law Firm at (305) 285-1115 for a free consultation. Florida leads the nation in the frequency of storefront crashes each year. Moreover, 1 out of every 4 crashes in the state occur in Miami-Dade or Broward counties. While drivers of any age can cause storefront accidents, elderly drivers cause the highest percentage of crashes. In Florida, elderly residents over the age of 60 hold 19% of the driver’s licenses in state. However, they cause 45% of the storefront accidents in Florida. Storefront crashes occur for many reasons, with one of the most common being pedal error. Drivers who confuse the accelerator with the brake can send a car barreling through the front of a store when they are trying to back out of a space. Pedal confusion can also cause an accident in locations whereby cars pull up close to curbs or the sides of buildings to pick up or drop off passengers. Victims who have been injured in storefront crashes have rights. If you have been injured in a storefront accident, contact the personal injury attorneys at the Wolfson Law Firm for help. Our personal injury attorneys will defend your rights with insurance companies and their legal teams to help you receive the compensation that you deserve. The Wolfson Law Firm serves clients located throughout Florida. We proudly serve the communities within Miami-Dade, Broward, Palm Beach, and Monroe counties. If you or your loved one has been the victim a storefront crash, contact the Sabor Tropical Supermarket accident personal injury attorneys at the Wolfson Law Firm at at (305) 285-1115 for help.